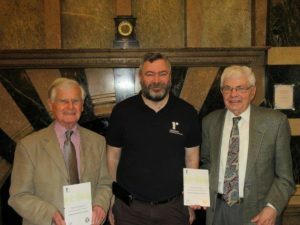 Congratulations to Don Davenport and Dereck Smith from Sheringham Ramblers, who have been awarded certificates for their long service to the organisation. Dereck Smith has been a loyal servant of Sheringham Ramblers for over twenty years. In that time he has served on the committee for many years as well as being a regular helper at our many social events. However it is as a walk leader that he has made his greatest contribution,always offering 3 walks every booklet (ie, 9 long walks a year). In fact this is the first year that he has had to miss any, after suffering inflammation of one leg-he complained to his doctor that he was having to miss his walks-to which his doctor replied that he was 85! He is now back leading Ramblers as well as his U3A groups as the popular leader he has always been and someone right at the heart of the local group. Don Davenport has also been a loyal servant of Sheringham Ramblers for over 20 years, has also been a committee man for many years and a regular contributor to the walks booklet, also as a leader of the longer walks. Don also has specialised in themed or event walks in recent years, linking in with the local carnivals. He was a prime mover in taking Cromer into the Walkers are Welcome organisation, and thus like Dereck he has contributed enormously to the well being of a good cross section of local walkers, Ramblers and others. Don is well known to all at Sheringham Ramblers and well respected. “It is always a great pleasure to present awards to members that have done so much for walkers in Norfolk, and to recognise all of their hard work. Ramblers, both in Norfolk, and GB wide, achieves great things because of our many dedicated volunteers. Congratulations to Dereck and Don, for their well deserved awards”.